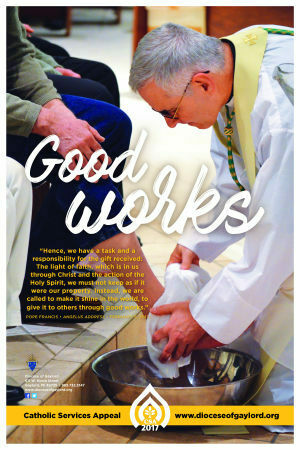 “We are a family rich in good works!” This is the Catholic Services Appeal (CSA) theme that we as a vibrant faith community in the Diocese of Gaylord will embrace in the 2017/2018 campaign year. We, as brothers and sisters in Christ, have been made alive in Him. We are filled with God, which means we are filled with good - and good works flow from us to light the path for others. This theme will remind us to live the Beatitudes and celebrate the grace of God’s presence within us always. Each year the Catholic Services Appeal helps financially support the seat of our diocese, the chancery in Gaylord; providing resources that make it possible for our clergy and lay leaders to organize, facilitate, and put forth efforts that nurture God’s grace and bring about good works. The purpose of the CSA is to help provide funding necessary to carry out the mission of the Catholic Church---to build our families, our parishes, our diocese and our world into that faith community whose compassionate ministry to humanity embodies and witnesses to God&apos;s power. The CSA supports numerous services and ministries, some of which attend to needs that are beyond the scope of any individual parish. Some exist for the sole purpose of assisting parishes in their mission to teach, evangelize and provide good liturgical experiences. It is important that the people recognize both aspects of the appeal. If at any point during the CSA there are any questions, problems or additional needs, please contact the Diocesan Development Office. Bishop Raica&apos;s CSA message - hit the link below.